- 5,566 homes closed for a closed dollar volume of $1.77 Billion. June traditionally starts slow and then proceeds to finish strong. Home prices and mortgage interest rates are rising! - The inventory of homes available for sale continues to increase for the third consecutive month. - Buyer demand remains strong even though interest rates are increasing. - Overall, the Denver home market has a two month supply of homes available for sale at the current sales rate. Single Family Residential homes have a 2.24 month supply and Condos have a 1.93 month supply. The Real Estate market is healthier than it has been in years and it is continually changing. Is now the right time for you to sell your home? Two questions – First, if you decide to sell your home, is your home ready for the current market such that you will maximize top market value? Second, if you decide to sell your home, what will you do once the home is sold? A seller’s home is unique and each and every prospective home buyer is unique. With that being said, as a seller, have you done everything needed to prepare your home for being on the market and selling during this prime season? While the Denver home market can be portrayed as a “seller’s market”, each and every home is unique which suggests professional assistance in selling the home. Real Estate is local, contact your RE/MAX Professional to discuss the options available to you. Home Buyer, what should you do? That is the question of the day. Should you participate and move forward to purchase a home or should you wait until a later date? Is now the right time for you to become a homeowner? What is and what will be the impact of rising interest rates? - 5,665 homes closed for a closed dollar volume of $1.7 Billion. School is out and the traditional prime home selling and home buying season is in full swing. 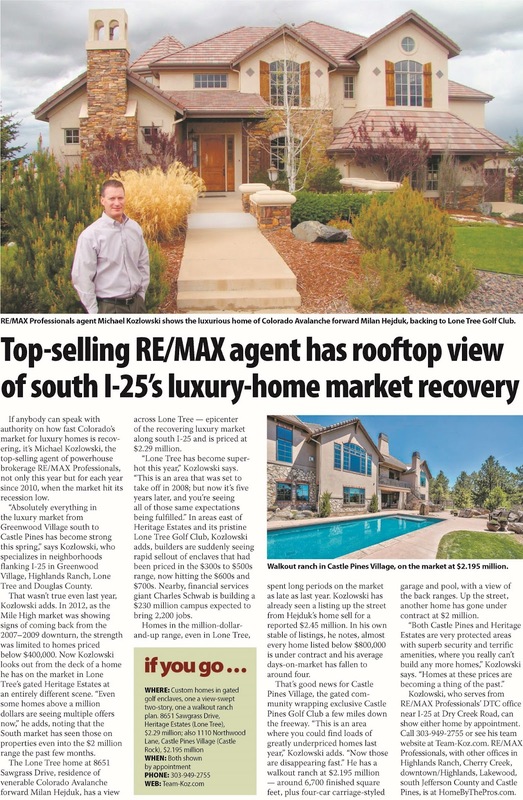 - The inventory of homes available for sale increased in May by 1,269 homes which is a benefit to the entire Denver resale home market. - Buyer demand continues as well as multiple offers that are becoming more creative every day. - Overall, the Denver home market has less than a two month supply of homes available for sale at the current sales rate. - Single Family Residential homes have a 2.02 month supply and Condos have a 1.79 month supply. School is out and the traditional prime home selling and home buying season is in full swing. While there are more homes available for sale at May month end than previously throughout the year, a seller needs to be prepared for the Denver home market. Will your home create that lasting impression? Are you current on the preventative maintenance items needed for your home? Have you de-cluttered your home? To maximize the selling price, have you done recent upgrades? Since selling a home is not an everyday activity, a seller needs to look to a professional for assistance for these and other questions. School is out and the traditional prime home selling and home buying season is in full swing. While there are more homes available for sale at May month end, other factors have an impact on the market. Interest rates are rising and new mortgage guidelines have been implemented. Complete the pre-qualification process so you know the price range that you qualify for when you are purchasing a home. Be prepared for the speed of the market and manage your expectations in order to timely participate in the Denver home buying market.